Despite a persistent rumor, neither the S.C. Department of Natural Resources (SCDNR) nor any other state agency will compensate motorists for injuries or damages resulting from deer collisions. In addition to practicing safe and defensive driving techniques, every motorist is encouraged to have adequate collision and comprehensive insurance. SCDNR Assistant Big Game Program Coordinator Jay Cantrell advises motorists throughout the state constantly be aware of roaming white-tailed deer on roadways. "As the human population of South Carolina continues to increase, more people move to rural areas and more vehicles are on the roads," he said. "Increases in deer-vehicle collisions can be expected." The S.C. Department of Public Safety reported approximately 2,300 deer-vehicle collisions in 2015, similar to figures from the last few years. These figures are lower than those reported in the late 1990s when the incidents of deer-vehicle collisions seemed to peak in the state. According to Cantrell, this decline may have more to do with changes in reporting criteria or lack of reporting for minor damages than with an actual reduction in collisions. Although deer-vehicle collisions are an issue in South Carolina, in comparison to other states in the Northeast and upper Midwest, South Carolina's number of incidents is not that high. Many states have between 30,000 and 50,000 deer-vehicle collisions per year. "Sound deer management through regulated annual harvests is the most effective way of curtailing deer-vehicle collisions," Cantrell stated, "but following some common sense rules for driving defensively in deer country will make the trip safer." White-tailed deer are masters at evading predators. 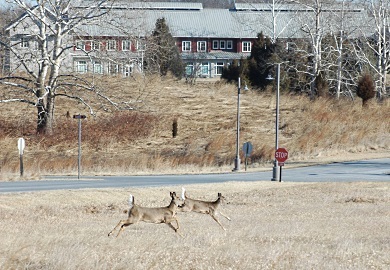 However, these same predator-avoidance instincts often cause deer to bolt in front of oncoming vehicles. When deer are sighted well ahead of the vehicle, Cantrell recommends sounding the horn several times, flicking headlights (if no oncoming traffic is present) and reducing the vehicle's speed. If deer are sighted only a short distance in front of the vehicle, these same collision-avoidance techniques – honking the horn and flicking lights - may spook the deer into running across the road, therefore increasing the likelihood of a collision. In that, case it is best to just slow down. Always anticipate another deer if you see one or more crossing the highway, and do not expect the deer to get out of the way. Fortunately, deer-vehicle collisions typically involve damage to the vehicle rather than human injuries. The most serious injuries occur when the motorist loses control of the vehicle and hits an immovable object like a tree or embankment while attempting high-risk maneuvers to avoid a deer. If a collision with a deer is imminent, it is best to hit the deer rather than risk losing control of the vehicle. Motorists should understand that deer crossing signs, diamond-shaped signs bearing the silhouette of a deer, mark a stretch of road where deer have been hit previously. However, these signs do not mark specific deer trails. Deer may frequently cross for several miles where the signs are posted. Studies show about 45 percent of deer-vehicle collisions occur in a roughly 60-day period that corresponds with the deer breeding season. In South Carolina, the deer breeding season, or rut as it is commonly referred to, is generally during the months of October and November. Deer movements - and deer-vehicle collisions - are at their peak during the breeding season in October and November. Also, most vehicle collisions occur near sun-up and sun-down because deer tend to move more during these times. Unfortunately, these are also the times that most people commute to work in their vehicles. "Pay attention to changes in habitat types along the highway," Cantrell said. "The zone between habitat types is a likely place for deer to cross a road. Creek bottoms and where agricultural fields meet woodlands are also prime areas for deer to cross roadways." Rural or secondary roads rank highest in deer-vehicle accidents because of the frequent curves and narrow shoulders. Motorists often have little warning and therefore limited reaction time when they see deer. South Carolina's deer population peaked in the late 1990s, as did the number of deer-vehicle collisions. Fortunately, thanks to efforts by hunters in addressing the increasing population, deer numbers have moderated since 2000 and the statewide population is estimated to be about 30 percent less now than at the turn of the century. What should motorists do if they hit a deer? "Report the incident to the state Highway Patrol or local law enforcement and to your insurance company," Cantrell said. Deer killed by vehicle collisions can be kept for consumption as long as there is an incident report stating the deer was killed by a vehicle and not illegally shot.